I’ve spent the morning thinking about the sequence of models for my course and developing a storyline for that particular sequence. I really liked the idea of using the characteristics of life as a hub for the course and launching off into different models to explain those characteristics. Eventually I’d like to be able to let the students guide the movement through the course as we investigate different ideas. But for now I think that it is important that I maintain a similar course sequence to my colleagues. I teach in a department with two other biology teachers and we have a number of common experiences and assessments for our students. 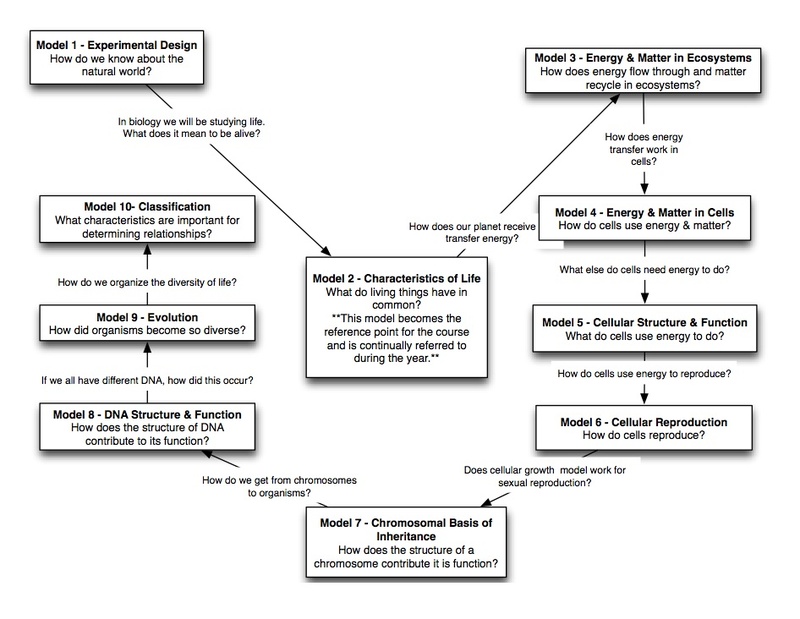 With that in mind, I created a flowchart, using OminGraffle, for my model sequence with questions to help guide the transition from one model to the next. By no means is this set in stone, but I wanted to get it down somewhere so I could begin reflecting on it. I’m inserting a picture and also posting a pdf file. I’m happy to share the OmniGraffle file if anyone wants it. Any thoughts would be appreciated! I love this! We should chat about re-organizing. Do you mind if I share this with my bio team? Not at all. I figure the more folks that look at it, the more feedback I’ll get. I’ve done a little bit of refining after looking in more detail at the Modeling Units. The Cell Unit has protein synthesis & enzymes in it and I really like that. It actually fits better with my Cell Structure & Function Assessment which is a big visual analogy poster. The Reproduction Unit has DNA Replication (also an idea I’ve kicked around) and DNA Technology, which does seem to fit.